that's why it's called a movie. Too bad. You missed a lot of interesting stuff. 1. He didn't rip it earlier because he was in shock. 2. He shot the gears and they continued to move, the gears were strong enough to keep going. 3. He forced the fat man into the machine because the choices that the man made angered him, and he wanted him to suffer. 4. The husband's key points put him in more pain than the wife, and the fact that she was controlling the pain made her more able to bear it. And she didn't leave before the cops came, it was stated that she identified the black cop and gave a statement. 5. He gave Matthews the gun because it was in the list of his tasks. He was told to. He knew that if he tried to un-trap the door, it would have the adverse effect that he wanted. He couldn't mask the FINAL TEST message because he couldn't open the door to get to the other side to mask it. And can you explain to me the very ending of this movie? 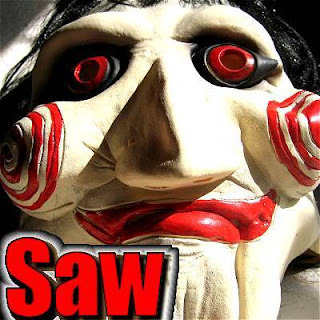 Was the tape in the wax from the dead body of Jigsaw the one that told the man who was doing everything what to do? If so, this doesn't make sense because the autopsy wasn't until the very end of the time sequence, because the body was still in the room near the end. Not really. The problem is - in almost every puzzle Jigsaw victims have plenty of opportunities _not_ to play by the rules, thus botching the whole "game". There is no point in a game that can go wrong because of so many random factors. This makes the movie look not well thought through, and turns Jigsaw from a "brilliant human soul and engineering mastermind" into a simple, medium-witted petty criminal. Jigsaw could just run around smashing people with a club - it would at least make the movie entertaining. I think that he is playing by what he knows about human nature. If it were me, I probably wouldn't be able to think it through. Especially with the types of time constraints that he gives. What bothers me about these movies after the third or fourth one is that the chronilogical order of the plotlines makes no sense at all.